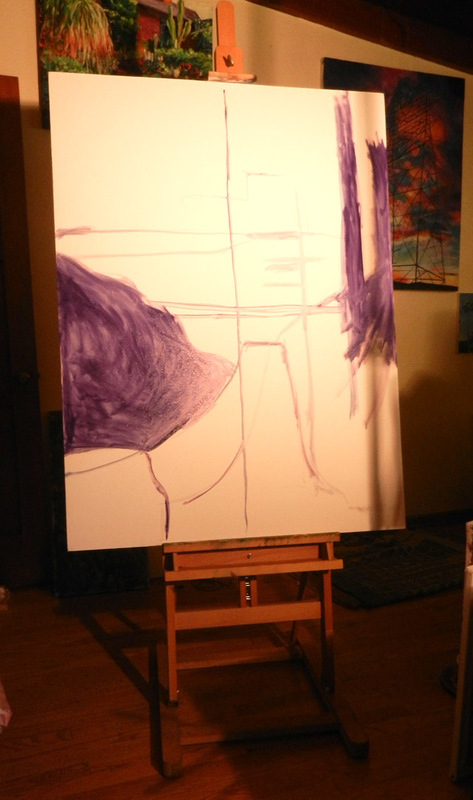 A rough block-in of quadrants and darkest darks in dioxazane purple. I invite you to look over my shoulder as I attempt to bring to life in oil paint a sunset vista of the Glendale, California skyline. The clock is ticking. In a little over eight weeks I need six to ten new paintings for a three-artist show at the Fremont Gallery in South Pasadena. Theme—the radiant light of Los Angles. A few weeks ago I happened on Adams Hill in Glendale—a long straight avenue diving through a neighborhood and then rising up towards the mountain-backed skyline of Glendale. A couple days later I returned at sunset and shot dozens of photos from the top of Adams—the street coasting downward in cool blue; the distant city center blazing. Perfect! One photo in particular speaks to me. I had intended paint this new series on medium/small canvases. But no, this particular image demands much larger. 36 x 48. I always work on a bunch of paintings at one time. We’re like a family taking a road trip—it’s an adventure and a journey of discovery. I started Adams late in the day after working on four other paintings. I wanted to stop, but I had to at least sketch the large shapes. Mission accomplished. I’ll check in again next week and share my progress.